Ihor Indylo died one night shy of his 20th anniversary. He and a friend had a little drink at the dorm in the evening. As the two parted, Ihor had an argument with an on-campus police officer and ended up escorted to the Shevchenko rayon police precinct. Later in the evening, the faculty pleaded with the officer to let him out for the night. The officer declined, saying Ihor was misbehaving at the precinct and would be detained for three days. As Channel 1+1 found out, ambulances had rushed to the precinct four times during the night but had refused to hospitalize Ihor. In the morning, the faculty called Ihor’s parents to tell them they could take their son’s body home. The police side of the story: Dead-drunk and unruly, Ihor fell and hurt himself. Three times. However, the autopsy report somewhat contradicts that account, Channel 1+1 says. Shockingly, the autopsy had been performed before the parents learned of their son’s death. The pathologist wouldn’t allow them to fully examine his body. The faculty says Ihor didn’t have drinking problems. An eye witness says Ihor looked fine as he stepped into the police car. Yanukovych says he wants to know what happened as Shevchenko rayon police chiefs have been suspended in the ongoing probe. I’ll tell you what happened, Mr. President. It’s “Ukraine for the People,” remember? 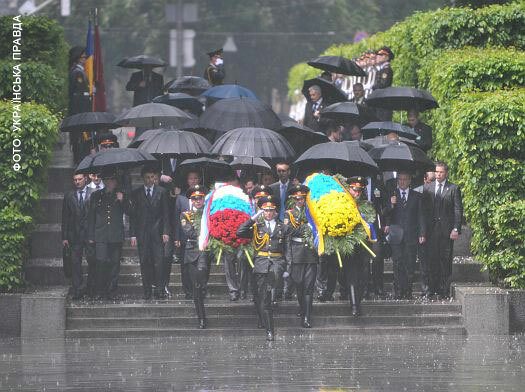 As long as the people of Ukraine don’t act like the people of France, Greece and Romania, you can sleep well. A few more facts and figures. Ukraine employs a police force of 302,000 for a population of 45,905,300 (2010). By comparison, the U.S. employs a police force of 883,600 for a population of 305,529,237 (2009). The SBU, our security service, totals 33,000. That’s the size of the FBI. Size means security? Wrong. It means corruption, mismanagement and brutality. Upholding the law of the jungle requires a lot of people skills. Some people get their palms blown away. And some only have months to live. Either my way or the highway. Vladimir Kornilov, Zatulin’s franchisee in Ukraine, doesn’t mince words. Kornilov: Of course, sooner or later we'll have to put this reality into law as well. At any rate, sooner or later there will be two official languages in Ukraine, or there will be no state of Ukraine in these borders. What about the Baltics? Should they have two official languages too? You don’t mess with a lawmaker like him. Name: Oleksandr Feldman. Net worth: $266.5M. Tymoshenko booted him from chairmanship of the Kharkiv BYuT chapter. And look how he got his groove back. 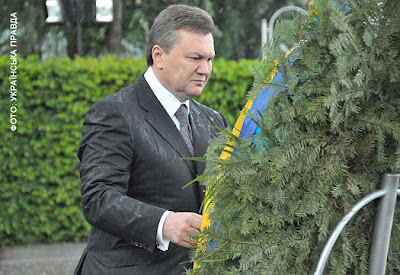 He dumped Tymoshenko and joined the Coalition of Carcasses. His other consolation prize: a rare Harley Davidson, a 50th anniversary birthday gift from his son, 24. Asked about the price, he said his son, already a father, doesn’t maintain separate finances. Will the Mezhyhirya Man let him use that special highway? Україна (Ukrayina) means different things to different people. To some, it means країна (krayina), Ukrainian for country, region or land. To others, it means окраина (okraina), Russian for outskirts, borderland or edge. Naturally, to most Russians, Ukrayina means okraina, not krayina. Ironically, despite this marginalization, it also means a place — the place — from which they trace their statehood. Ladies and gentlemen, meet Konstantin Zatulin. He’s one of those Russians, and a member of Russia’s parliament at that. He’s a veteran crusader who can’t get enough of patronizing Ukraine now that Yanukovych lifted his persona non grata status. Host: You see how the audience is responding. Zatulin: I want to tell you that my relatives and I myself moved out of the Poltava Governorate, Ukraine, two hundred years ago. Living on the edge is a great historical...a great historical advantage. That’s why... And we, too, live on the edge, if you will: in the East, in the West. You don’t...you don’t have to react like that. Host: Thank you! Please, please, please, ask your question, pani Hanna, pani Hanna, I'm asking you, please ask your question. Herman: ...saying that Ukrainians are the Russians who live on the edge. It is an insult to our people, pan Zatulin. Host: Let's, let's, please, please, please, your question, please. Herman: I want you to understand that. Zatulin: I see...I see that, toward the end of our program, the sense of humor is beginning to fade. OK, let’s say those [Ukrainians] are the Old Russians who live on the edge. Nice hit-and-run strategy! First, you tell us we’re fringe elements. Second, you sense trouble and soft-pedal. Third, you call it a joke. Hahaha! Now here’s the real joke. If you call your country Rossiya and trace it to Kyivan Rus (quite a stretch), why in the world would you call Kyiv okraina? Was Kyiv founded by Muscovy? Or maybe Christianity came to Kyiv via Muscovy? If every guest speaker meant what he or she said, we’d be a G20 country. But your efforts will not be in vain, because the course is right, even if the path is difficult. The toil is bitter, but the harvest is sweet, as the old proverb says. In time, your transformation will deliver better, more prosperous lives and the chance for you and your children to realize your God-given potential. You and your children will reap the harvest of today's sacrifices. In the pursuit of peace and prosperity, you have been well served by President Kuchma and his government's bold and farsighted leadership. You should know this: As you build your future, the United States will stand with you. 15 years later. The Children of the Sweet Harvest meet another guest speaker: Dmitry Medvedev, President of Russia. On a lighter note, he promised them that Russia wouldn’t use its Black Sea Fleet against neighbors. Medvedev: Let’s have a straight talk: Will Russia use its Black Sea Fleet to attack neighboring states? No, it won’t. Hahaha! We’re a peaceful country. One of the students turned out to have a name that’s hard to forget: Ihor Yushchenko. That didn't spoil the party. Medvedev got high marks from the audience. Among other things, he recalled attending a conference at the University two decades ago as a postgraduate from Leningrad. An easygoing democratic type, he now reads Gogol on his iPad. ProFFessor of Economics. Master of International Law. 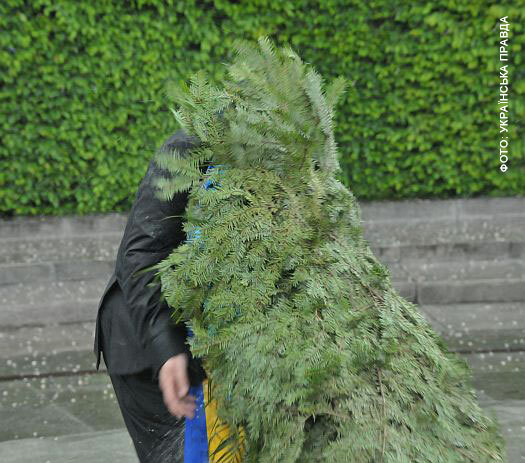 Wreath-wrestler. Ladies and gentlemen, I swear to Anna Akhmetova he knows what he’s talking about! 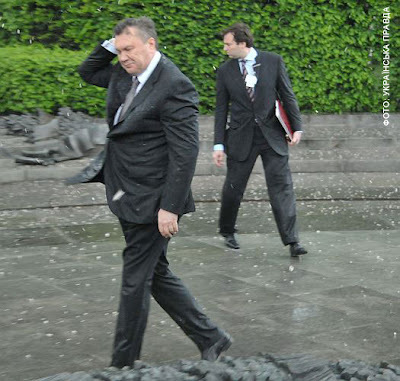 Yanukovych: Of course, we have issues of quite some principle that we’ll have to work on. For example: the demilitation of our...uh...of our sea borders. 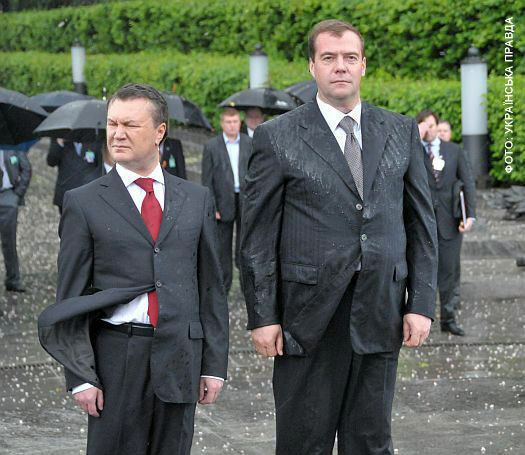 Watch Medvedev digest demilitation. Look at his eye movement. One more Yanukism and he would have wet himself. As of Tuesday afternoon, only three Ukrainian channels have aired this: Novy.tv, KanalUkraina.tv and 5.ua. Reuters reportedly complied with the Yanukovych admin's request to keep the embarrassing footage in the closet. That's something Medvedev can be proud of. As you can see, he barely escaped the attack. These ladies know how to grab attention. They're the ones who showed up at Yanukovych's polling station of choice. With Ukraine now firmly in Russia's chauvinist grip, they decided to beard the bear in his den once again. In Kyiv, a Yanukovych-Only Highway! All roads lead to Rome? No way! Some roads lead straight to Mezhyhirya. From the maker of “Ukraine for the People”... The road that few people can approach, let alone use! Man [in surzhyk]: We love Yanukovych — always have, always will! I am always by your side! Woman: And no one will sever our ties to the Russian people. We are one whole: Ukrainians and Russians. And no one... And they’re against the Russians! They’re for America! 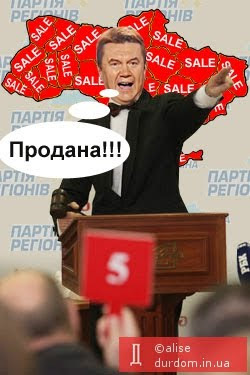 Man: They’re selling out Ukraine! Maybe the Japanese and Koreans are one whole too? 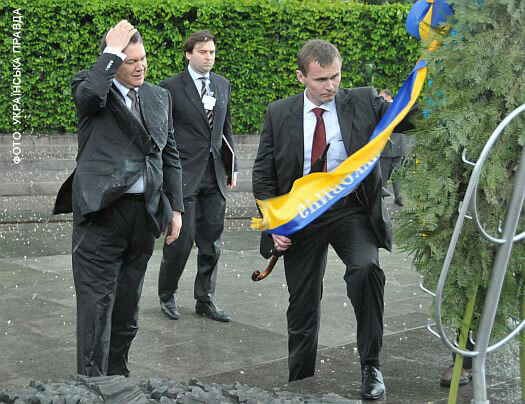 As the ambassadors of Lithuania and Britain invented cleanup diplomacy, Yanukovych and Azarov invented the guilt-tripped subbotnik. Yanukovych: Let me be honest: I invented it — this day. That’s right. When I convened the governors for the first time, I asked, I said: “I’ve been to many towns during many campaigns. The amount of dirt I saw there — I’d never seen so much before. When do we get to clean up all this dirt? When do we get to put some order? When do we start to plant some trees? 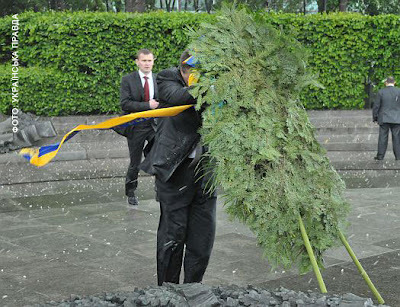 Azarov: Where there’s garbage, we’ll tell Lenoid Mykhailovych [Kyiv Mayor’s name, patronymic] right way: Lenoid Mykhailovych, get out of the bus, get a shovel and clean that garbage with those who are supposed to do it. Our capital, our country’s capital doesn’t have to be full of garbage. So let’s plant a few trees here, drop a few publicity bombs there and call it a day? How about a policy of sticks and carrots (smart subsidies, fines, eco-friendly packaging, reusable bags, etc)? How about a recycling industry? How about a culture of environmental stewardship as opposed to a culture of grabitization? Stepan Khmara, 72, comes from the old school of opposition. His opposition took him through seven years of political imprisonment in the ‘80s and three consecutive parliamentary terms in 1990-2002. In remarks below, he reflects on the opposition’s handling of the gas-for-fleet ratification process. Stepan Khmara: When I saw this picture of them standing...uh...by the flags, I knew pretty well that...uh...the meeting wouldn’t be...uh...disrupted. Because if you want to do it, we really did it — and quite a few times. And they had to unfold that flag, hold hands, pose before the cameras and so on. They weren’t thinking about the result. They needed the picture. That’s why it was an ugly scene for me to see. I kind of agree with his assessment. The make-some-noise technique goes only so far. Reform #5: Comrade Obama $talin will take care of press freedom. After decades of damnation, the Steel Man who had murdered millions of innocent people won himself a magic resurrection. His resurrection sent two of his elderly fans to the hospital and one to the graveyard. “She died a decent death, in front of Stalin,” as one fan put it at the opening ceremony in Zaporizhia. On a hot sunny day, hundreds of Stalinists, anti-Stalinists and police attended the ceremony on the premises of the local Communist Party chapter. Because the monument sits on private property, those who oppose it should stay away from it, MP Oleksiy Baburin (CPU-Zaporizhia) argues. One fan donated Hr. 50K ($6K) to the Hr. 80K ($10K) monument cause. Petro “$13K Watch” Symonenko? No. Commie-friendly oligarch Grigorishin? Wrong again. One sign reads: “Arise, Stalin! Put some order!” It’s a deal! Let’s have some order. Let’s start with the commies in this oligarcommunist govt. Lead #1: Customs chief Ihor Kaletnyk. Let the NKVD ask him a few a questions, OK? 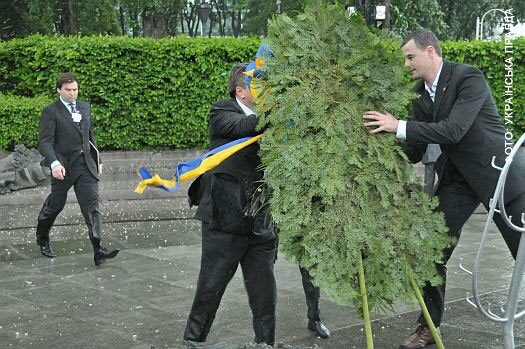 In the meantime, some Ukrainian reporters claim to have already experienced strokes of censorship. A report that criticized the government went down the drain, say the news people at Channel 1+1 in a public statement released Thursday. After a closed-door beer summit with the reporters, Deputy Chief of Staff Hanna Herman said she found to signs of censorship. And guess what? On Friday, eight STB reporters went public with censorship claims of their own. The oligarchs run both channels. Channel 1+1: owned by Ihor Kolomoisky, Ukraine’s third-richest man, of Israeli citizenship, who lives in Switzerland. STB: owned by Viktor Pinchuk, Ukraine’s second-richest man, Kuchma’s son-in-law, a ‘Thinker’ according to Time magazine. So how long before reporter killings become the norm again? In a rare mea culpa statement, Rep. Marcy Kaptur (D-OH) says what I’ve said so many times. The argument that the U.S. heavily depends on Russia for energy supplies doesn’t make a lot of sense though. Alas, Obama’s overview of world press freedom doesn’t include Ukraine. That’s despite accredited Ukrainian reporters getting barred from the Medvedev-Yanukovych press conference in Kharkiv and some others getting beaten in Kyiv, Lviv and Donetsk. 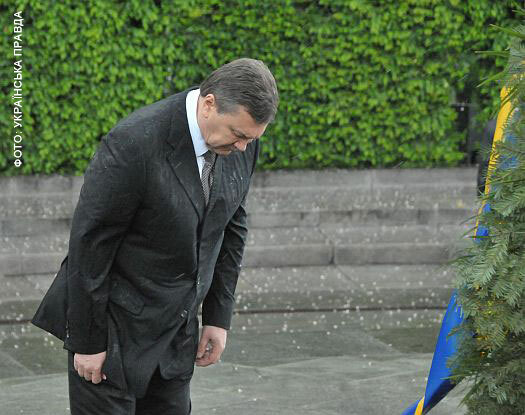 When Yanukovych blows Obama’s mind with that giveaway of $1B worth of enriched uranium, democracy takes a hike, right? Moving on, Secretary Clinton’s husband stands on record for accepting a $5M donation from the son-in-law/thinker of Kuchma. That’s the same Kuchma whom the free world linked to the mysterious murder of Ukrainian journalist Heorhiy Gongadze. Which brings us back to Myroslava Gongadze, Heorhiy's widow, who interviewed Rep. Kaptur. My voters like me, the West likes me, Russia likes me. Who the hell do you think you are if you don’t like me? Yanukovych: After five years of making an enemy of Russia, it was not easy to restore the Russian leadership’s trust toward Ukraine. But I have managed to do that and today I am ready to report to my voters. From now on, dialogue with our big neighbor will rest on the basis of equality, good neighborhood and healthy pragmatism, not confrontation and anti-Russian rhetoric. Was this achieved at too high a price? No. Because the agreements reached with Moscow are mutually beneficial. The documents signed in Kharkiv will secure a significant decrease in the price of gas, which means an increase in the social welfare of every Ukrainian, the beginning of our economy’s recovery from a deep crisis. It also means a guaranteed strength...strengthening of energy security for the entire continent of Europe. The entire civilized world has approved of the results of my negotiations with President Medvedev. In Washington, Brussels, in all European capitals, they are considered a definite success for Ukraine. It is only our opposition that re...remains unsatisfied. Why do they call you to new barricades? Why are they shaking up the stabilnist that was achieved for the first in the many years of endless wars between government leaders? Because once again they seek to dissolve Parliament in the name of so-called political expediency. Because they understand this: Stabilnist, a strong chain of command, order and normalization of relations with Russia is their political demise. Once again, they are struggling for power at any price. They need war. The recent events in the Verkhovna Rada have shown that the political adventurists are ready to toss smoke grenades not only on the Parliament floor but also at the entire Ukraine. We need stabilnist and development, the ability to work normally, pass reforms and be friends with our neighbors. And we will achieve this just as we have managed to resist, in kind, the opponents of changes for the better. Soon, you will be convinced that we are heading in the right direction. I bear personal responsibility for this. I promise you: Ukraine will be strong and prosperous. Movement toward this goal has begun. Speaking of movement, we now have a Yanukovych-only highway in Kyiv! This highway helps Yanukovych move from his Principality of Yanuco (aka Mezhyhirya) to his workplace and back — as people-free as possible. Reform #4 (underway): Naftogaz+nuclear power+aerospace industry+you name it=Friendship With Russia, Inc.